This antique analog thermometer is on a circle mount. 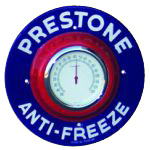 The circle is blue, and reads “Prestone / Anti-Freeze” in white text. At the center of the circle is the white thermometer and red border.